There are some mornings when only a bowl of warming porridge will do. It might be still dark outside, or you might be tired and in need of simple comfort food. I was brought up on oatmeal for breakfast, so that’s what I crave when I’m feeling a bit delicate in the AM. Oats are a grain. And while you can get gluten free oatmeal, oats do contain a significant amounts of carbs. Frankly, you can get more nutrients elsewhere without sending your blood sugar levels sky-high. 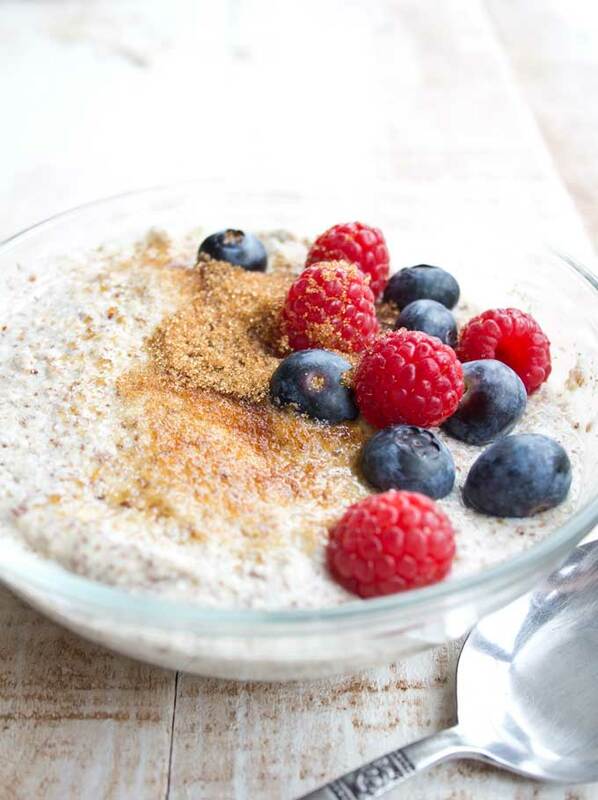 Luckily, you can make creamy and delicious low carb porridge using nut and seed flours! I have tried all kinds of combinations of flax meal / ground flaxseed, almond flour, coconut flour, ground sesame seeds, ground sunflower seeds, ground pumpkin seeds and ground chia seeds. All are delicious, and there really is not much that can go wrong. For one portion, use about 6 tbsp (US measuring spoons) of nut and seed flours plus 1/2-3/4 cup of liquid such as water or almond / coconut milk. If you want your oatmeal to be extra creamy and rich, you can even use coconut milk/cream from a can, using both the liquid and the firm parts. It uses ground sesame seeds, flax meal and almond flour. I find the sesame lends a lovely depth. The sesame flour you can make yourself. Just take a small bag of sesame seeds and blend it yourself in a food processor or with the attachment of a stick blender, Once it resembles a flour, store it in a mason jar. 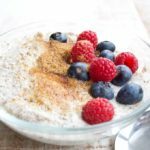 Can you make low carb porridge ahead? You can easily multiply this recipe and combine the dry ingredients in advance. 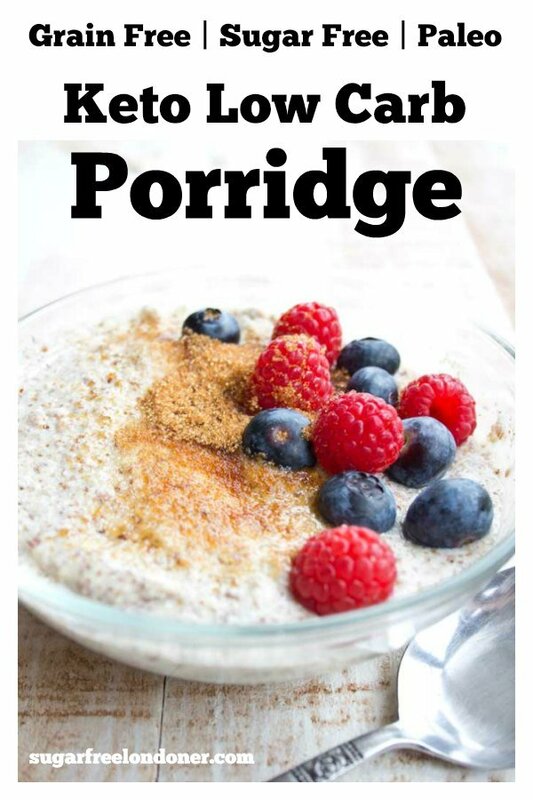 When you feel like a porridge, simply scoop out 6 tablespoons and mix it with your liquid of choice. I find that fresh is always best! As with regular oat porridge, Keto porridge has the habit of continuing to expand once cooked. You’d need more nut milk to loosen it before heating. Raspberry Swirl: Mash a handful of raspberries with a fork and add 1 tsp of erythritol. Swirl into the porridge after cooking. Peanut Butter Fudge: After microwaving for 1 minute, stir in 1 tbsp of peanut butter and 1 tbsp of double cream or coconut cream. Cinnamon Swirl: Melt 1 tsp of butter with 1 tsp of cinnamon and stir into 1 tbsp of sugar free syrup. Swirl into the porridge. Chocolate Chip: Add 1 tsp unsweetened cocoa powder and 1 tbsp erythritol to the mix before microwaving. Loosen with some additional milk or cream. Top with sugar free chocolate chips or shavings from a dark chocolate bar (at least 85% cocoa solids). Tried this low carb porridge? Give it a star rating below! 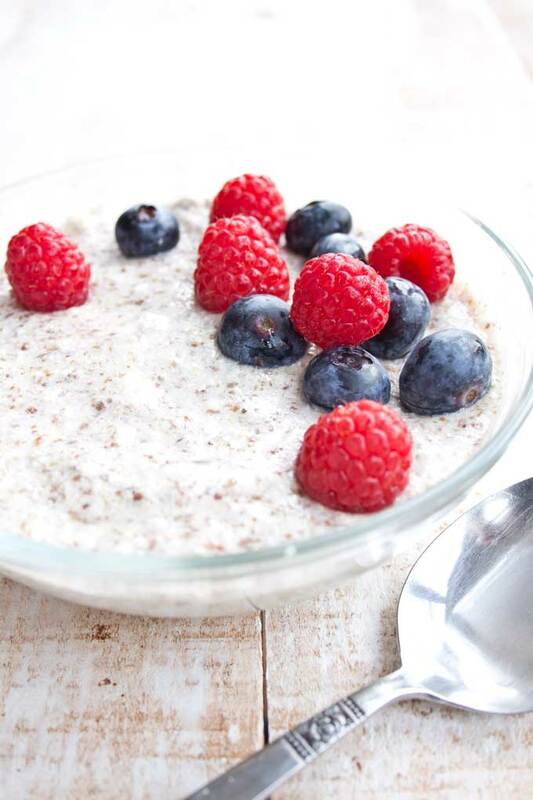 Get all the taste of creamy oatmeal without the carbs! 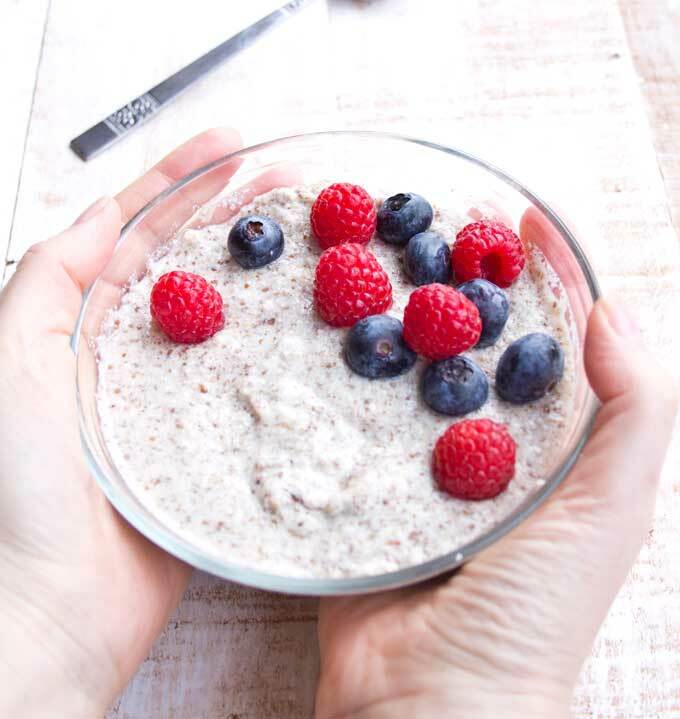 This easy Keto porridge is a super healthy low carb breakfast choice. Check out the post for plenty of recipe variations and ideas for toppings, from raspberry swirl to peanut butter fudge. 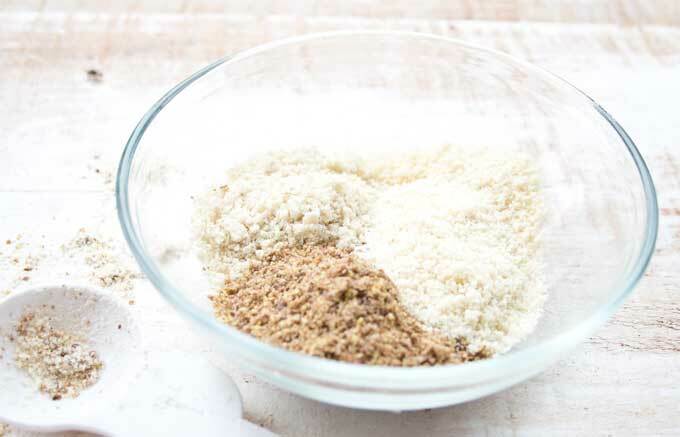 Place the flaxmeal, almond flour and ground sesame seeds in a bowl and mix. Add 1/2 cup of unsweetened almond milk and microwave on high for 1 minute. Stir. Then microwave another 1 minute. Add more almond milk to loosen if necessary. Sprinkle with erythritol and berries and serve. If you don't use a microwave, gently heat on the stove in a non-stick pot until the mixture thickens. Add more almond milk to loosen if necessary. See the posts for plenty of recipe variations and topping ideas, from raspberry swirl to peanut butter fudge. Nutrition is calculated for the porridge only, without berries. As a child, my Mama made porridge when we were sick. Though this tastes entirely different, it still satisfies that need for comfort food. I made the cinnamon swirl and it is wonderful! Thank you for this and all of your amazing recipes! Hi Sharon, I’m glad you found my site! Do leave me a comment on the post if you try a recipe and let me know how you liked it. I state the total carbs and the fibre in the nutrition breakdown, and to get the net carbs just deduct the fibre from the total carbs. I’ve tried a few “porridge” recipes & they were awful; the last I made with coconut flour turned out like glue & went straight in the bin! But tried this recipe with almond flour, ground sesame seeds, 1 tablespoon of flax & chia seeds & it was definitely more porridge consistency. I also added some cream! It was delicious & is definitely a “keeper”. THANK YOU! So glad you liked it Annette!!!!! I made the version with almond flour and used egg White protein, and added fresh berries and sliced almonds, and a dab of butter. Delicious! And not to mention your English muffins when the thought of Eggs Benedict can’t be put off any longer. Hi Ashley, let me know which one is your favourite version once you try them! Thank you for your amazing ideas.